She is currently the president of Kusog Han Kababayen Ha Salcedo (KAKASA), a local women’s group that has grown to 1,500 members in 36 (out of 41) villages in their municipality; and a regional representative for civil society organisations in Region 8. 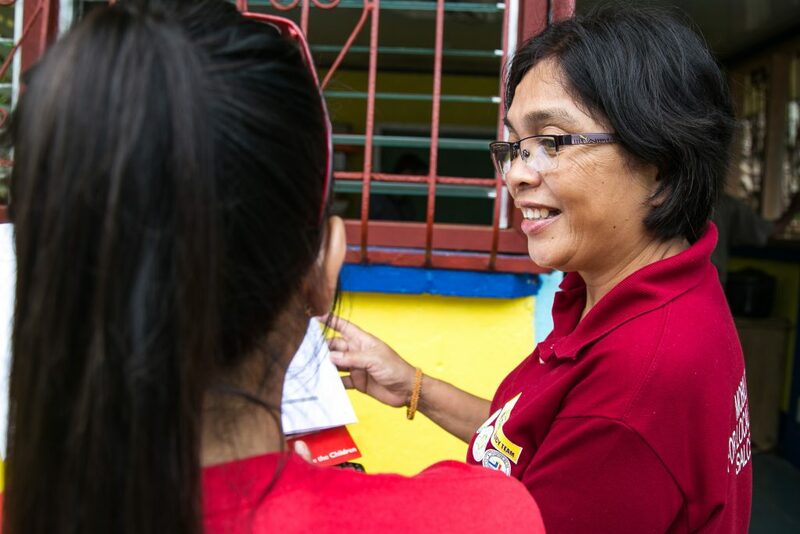 In 2013, she had just finished leading her husband’s campaign team as village leader when Typhoon Haiyan hit. Her husband, Reynaldo, 52, had to take his leadership oath amid the devastation. 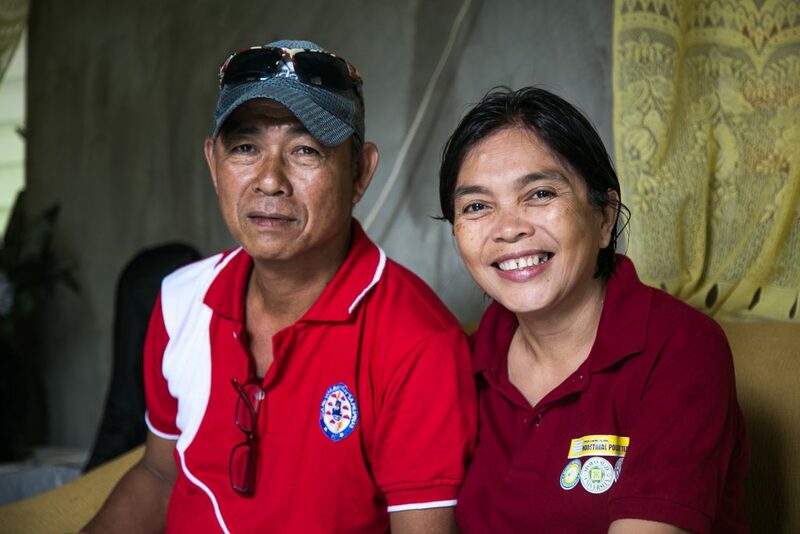 Felissa and Reynaldo, both 52, are marital and public service partners. Most belongings and supplies were either washed away or damaged. 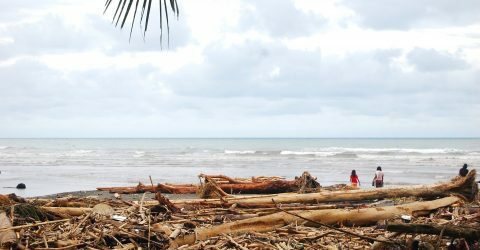 Families living in San Roque ate leaves, wild mushrooms and fallen coconuts. “We had to eat things we didn’t think were edible before. For us, eating was putting the food in our mouths and immediately swallowing them. It was that or we go hungry,”she said. Felissa thought if this continues, children will die of hunger. A week after, as the community grew more hopeless and supplies drained quickly, Felissa and her husband had to make a decision: one of them had to stay in case people arrived and the other would have to travel to Manila to get supplies and ask for help. Thus came Felissa’s decision to travel herself. “My husband was needed by the people. As village leader, he had to stay and be with the community,”she recounted. Felissa queued to ride a C-130 military plane to get to Cebu, then Manila. It was a long ride since no direct flight was available. 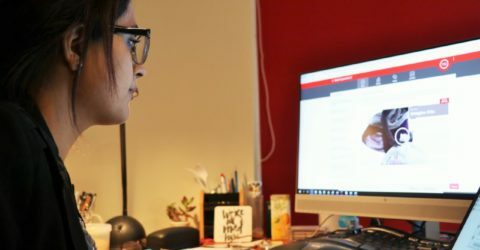 She personally went to collect funds from relatives and friends to buy supplies, then asked different foundations and media outlets for assistance. After days waiting that totalled to a couple of weeks, signing papers and going around for permits, a foundation finally accepted Felissa’s request for relief trucks to be delivered to her community in Samar. 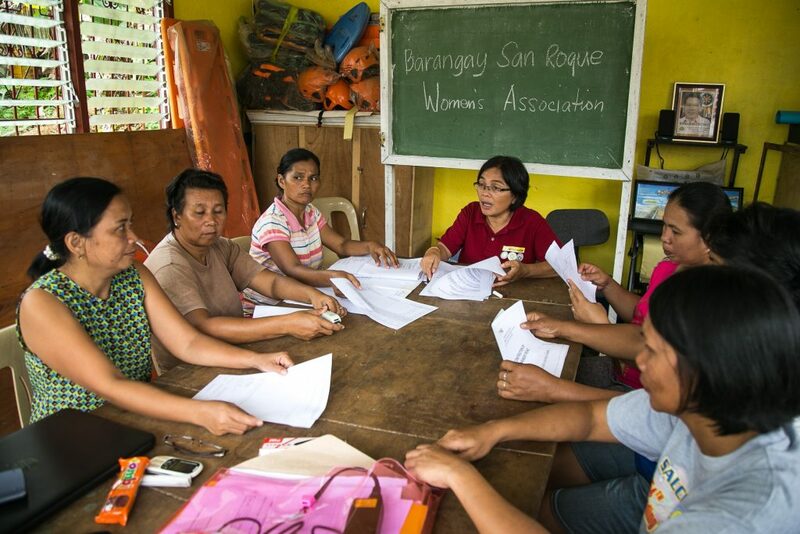 Though there was no casualty in her community, this experience cemented her belief on disaster risk reduction and the great role women should actively play in it. Emergency response equipment in the background. Felissa with some members of KAKASA have turned over their emergency gear to the village council to maximise its use. 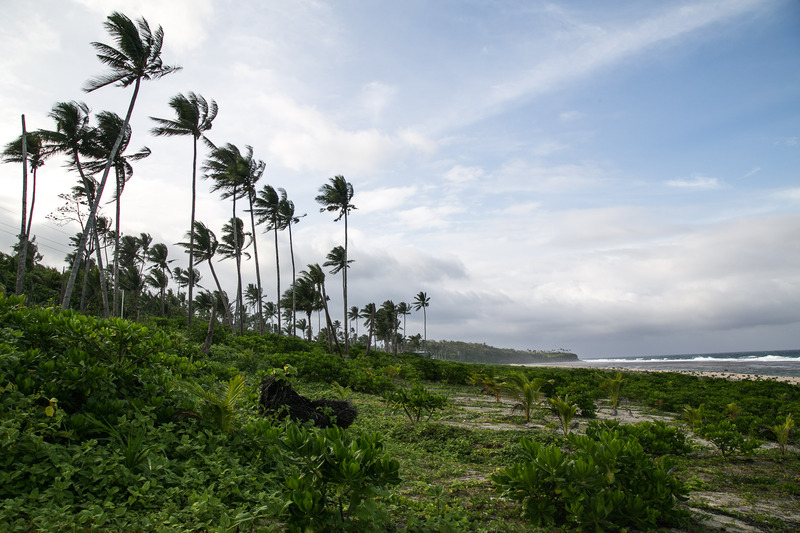 “We had training and early warning systems even before the typhoon, but people in my community were uninterested in these things. 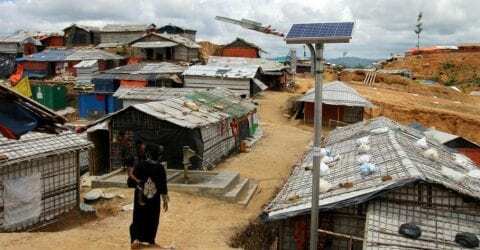 Many of my fellow villagers lacked the education to begin with,” she said. Felissa is one of the technical working group members who attend regular consultations with academe and government officials through Save the Children’s Alert and Ready Communities project. 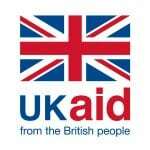 The project aims to support different groups in building and strengthening good governance systems. “In the beginning, I felt so small in the group. I thought, everyone here held regional government positions or were professors. Everyone spoke eloquently and knew disaster risk reduction and the related laws quite well. I felt blinded by what everyone talked about. I even told a fellow representative that I wanted to go home,” she shared. Through the project, different sectors, including Felissa as a civil society organisation representative, were trained in comprehensive child-centered disaster risk reduction management planning which enabled them as active members of their communities to localise their disaster risk reduction plans and structures. It was a way to bridge the technical inputs and operationalisation of these plans in each community. “Since then, there has been a big change in me, personally, my community, and the women’s organisation I work with. Our women’s group now has a committee specifically for disaster risk reduction, and we have a role in the community and municipal level, including the planning stage,” Felissa said. “This is important for us because now we are doing our disaster risk reduction plans beyond compliance. People from the community actually understand our plans. We know what to do and why we need to do it,” she added. Never missing any workshop, Felissa shares that the most important learnings for her had been understanding early warning systems and evacuation plans. Her community has had them before, but it’s only now that she and the community understand them. Felissa discusses the disaster risk reduction module with Save the Children staff. “Through our assessment and hazard drills, I learned how important some seemingly simple things are. During our assessment, we missed including lists of family names outside the evacuation centres which would have helped account everyone. We also learned the importance of assessing evacuation areas and the need for them to have separate areas for toilets, laundry, and kitchens,” she said. Felissa shares that in the future, in case a new disaster happens, her family and community are better prepared. Felissa has gone a long way and she won’t be stopping soon. Since her training, she has integrated disaster risk reduction in KAKASA and has involved community members in hazard drills and simulations. The Alert and Ready Communities Project will continue to train mentors from local disaster risk reduction councils, including the council from the municipality of Salcedo. 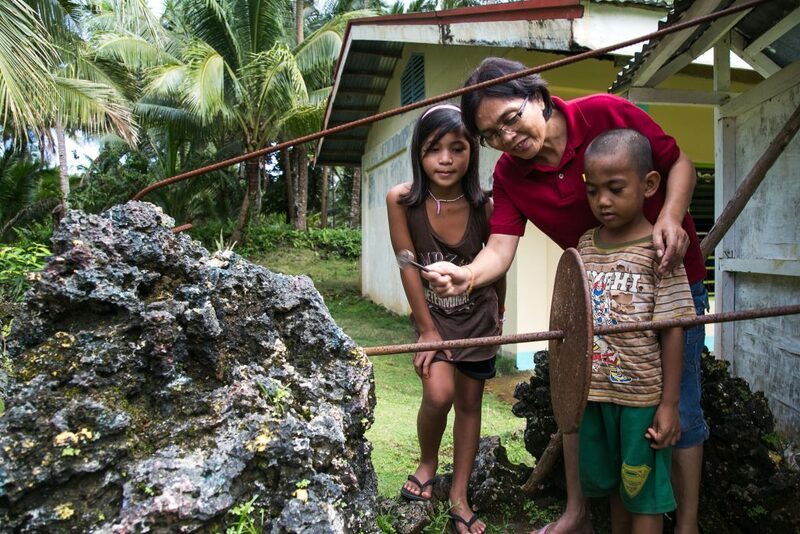 Felissa demonstrates how to ring the ‘batingting’ or emergency bell located in the nearby elementary school. These trained mentors will then help address disaster risk reduction gaps in the communities, including the quality checks on plans and making them more understandable and responsive to the risks communities face. For Felissa, seeing the world through the lens of disaster risk reduction is integrating the safety of the whole community, not just during disasters but also in everyday situations. Felissa and her 1,500-member women’s organisation is working with their village council, complementing help and bridging gaps together. Supported by the Humanitarian Leadership Academy Philippines, the Alert and Ready Communities project is being implemented by Save the Children Philippines in Region 8, Region 13 and the National Capital Region. 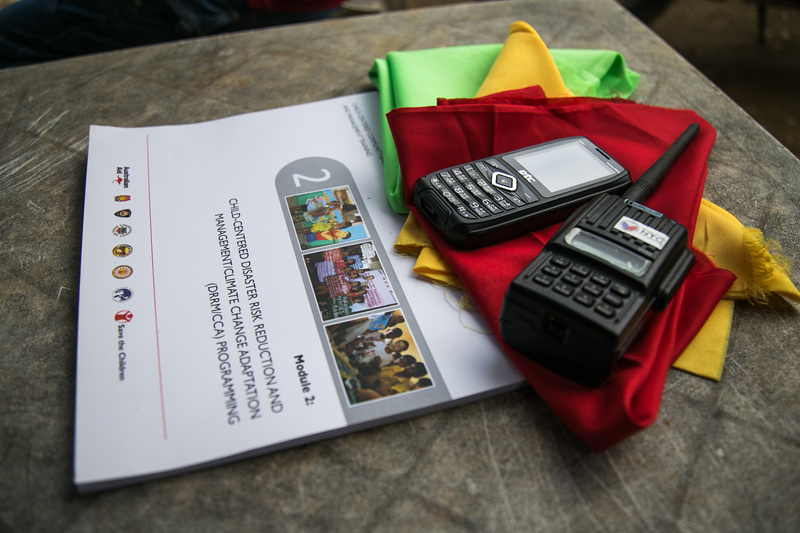 Accompanied with her essentials: modules on disaster risk reduction; 2-way radio; waterproof mobile; and coloured flaglets used as early warning signs.